In this video we cover the common question of what is a cell phone signal booster, the things you should keep in mind when deciding which is best for your home or office, and finally how to install the system. This small cabin in Northwest Pennsylvania is under 1000 square feet so we decided to use a zBoost YX545. The indoor signal readings were taken about 3 feet from the amplifier. When measuring the total coverage area inside, we looked for a signal strong enough to make calls without them dropping and still have data connectivity. Hi, I’m Dan from UberSignal.com and I’ve made the trek to a camp here in the countryside of Northwest Pennsylvania near the Allegany National Forest so I can show you how to install a Cell Phone Signal Booster. 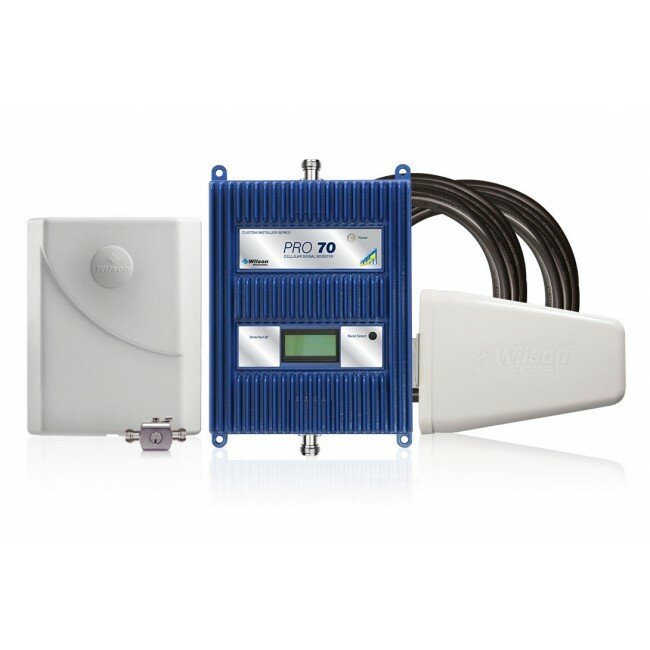 We’re going to take a look at the zBoost SOHO YX545, which is our most popular consumer cell phone signal booster and is ideal for this project. 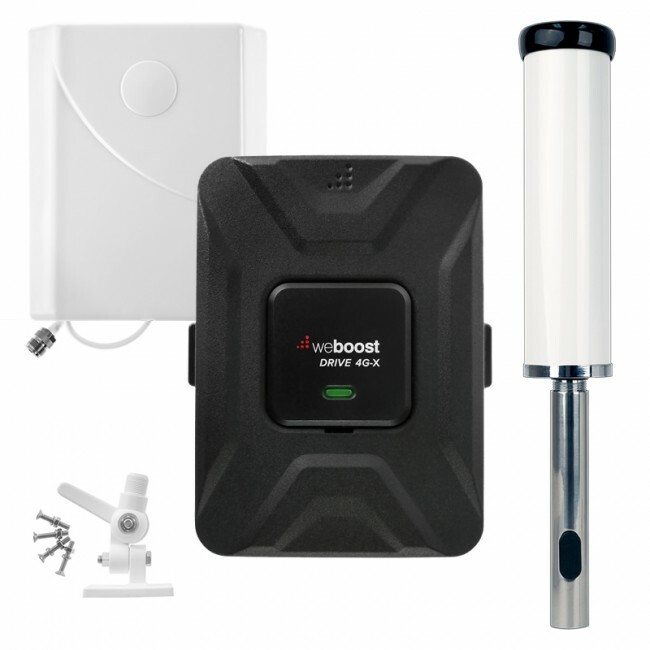 In case you’re not familiar, a cell phone signal booster is a device that takes a cell phone signal that’s available outside your home or office, amplifies it, and rebroadcasts it in an area where you don’t have a usable signal. So if you don’t have a strong signal inside, but you can make a call or at least send a text message when you’re outside, a signal booster can help improve your situation. Unfortunately, if you don’t have any signal at all outside, in most cases a signal booster will not be able to help. 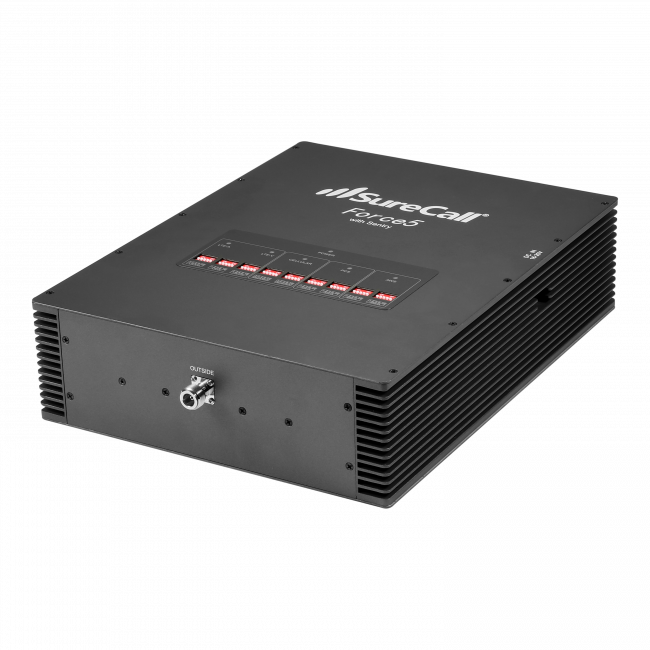 The YX545 is a dual-band amplifier that works with most major cell carriers with the exception of Nextel and some 4G signals. If you’re not sure if a signal booster will work in your situation, feel free to call our customer support. The YX545 has an advertised coverage area of 2500 square feet, which is large enough to cover the average home. However, this advertised coverage area is under ideal conditions so in most circumstances, you’ll get a smaller coverage area. It’s important to understand that the size of the coverage area is directly related to the strength of the signal outside. The YX545 box even says on the back “if your best signal is 1 bar, your coverage will be limited to one small room”. So don’t trust the advertised coverage area and keep in mind how strong a signal you get outside your home or office. Now that we’ve covered the basics of how a signal booster works, let’s prepare to install one. 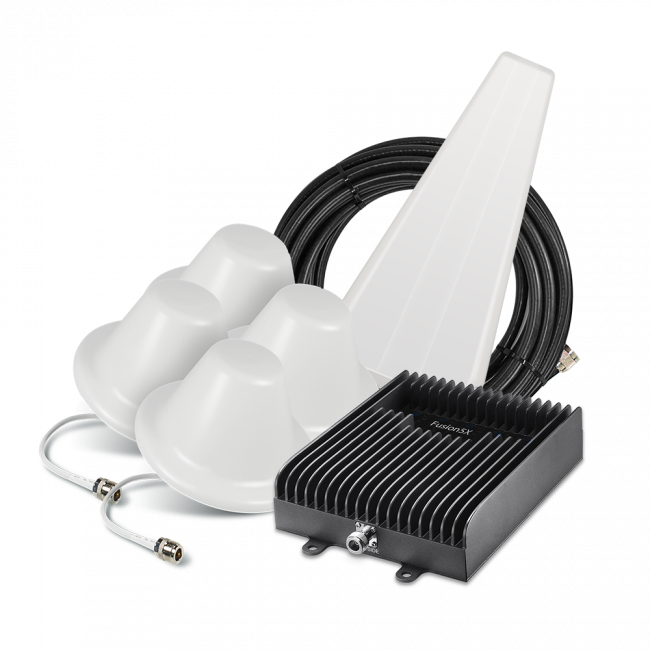 All signal boosters have the same basic components, an outside antenna, the signal amplifier, the inside antenna, and at least one coax cable that connects everything together. The first step in installing one is to find the best place to mount the outside antenna. The location of the outside antenna is important for two reasons. We already covered the first reason and that is that you want the strongest signal possible outside so that you get the largest coverage area inside. The second reason is that the inside and outside antennas must be far enough apart so that there isn’t any oscillation, or feedback, between the two. For the YX545, that means mounting the outside antenna with at least 15 ft of vertical separation between the inside and outside antennas. As shown on the back of the box, the YX545 has three mounting options. For the easiest setup you can mount the antenna on the inside of a window. For better performance, mount the antenna on the outside, next to a window. And for best performance, mount the antenna on the roof or in the attic. We always recommend the last option unless you get a very strong signal by your window and can maintain at least 15 feet of vertical separation between the antennas. So our next stop is up on the roof, but before we do, let’s check the signal inside so that we have a baseline to work from. I have a new iPhone 5 on the Verizon network. If you look at the Verizon coverage map online, you’d find that we are right on the edge of the coverage area, which is why we have spotty cell reception. My phone currently shows that I have 1 bar. While the number of bars gives you a general idea of how strong the signal is, it’s better if you can view your signal strength in decibels. To do this on an iPhone, you have to dial a special code (*3001#12345#*). On an Android Phone, just go to Settings and then About this Phone, and you’ll see the signal strength listed. As you can see when I enable the field test mode on my iPhone, the bars indicator changes to show the number of decibels. Decibels are a negative number so the closer to 0 the stronger the signal. Anything in the negative 50s and 60s is a very strong signal and anything less than negative 100 is getting very weak. Right now we have -106 decibels. To see if this will work, let’s try a quick phone call. We’re going to call the UberSignal offices. I’ve tried this a few times and about half the time it will connect but the call usually drops. The other half of the time, the call just won’t connect. So we’ll give it another second and see if it will connect or not. But you can see that it’s already taking a long time and that’s showing that we have a really weak signal that’s fairly unusable. We’re just going to go ahead and end this. We could also try a speed test. Again, I’ve tried this a few times. Sometimes it will actually start to work, but the speeds are incredibly slow. Other times it won’t even be able to find a closest server indicating that it has no network connection. It looks like this is one of those times that it’s just not going to work so we’re going to go ahead and cancel out of that. Alright, so with these basic numbers in place, let’s head up to the roof so we can find where we’re going to mount the external antenna. Alright, so we’re up on the roof and I’ve got my cell phone and we’re just going to walk around and try to find the place with the best signal so that we can mount our external antenna there. Now some cell phones only update their signal strength every 20 to 60 seconds so try pausing in each place so you can get an accurate reading. In this case, the signal on the roof is fairly consistent so we can attach the antenna wherever it’s most convenient and wherever we can get the most vertical height above the internal antenna. The YX545 comes with this mounting plate so you can either screw directly into the side of your house or it comes with this pipe bracket so you can mount it that way. We’re going to go ahead and do that to this old TV antenna. Now that the external antenna is mounted, the next step is to run the included coax cable. Now, the YX545 comes with this RG-59-Mini cable. It’s lightweight and easy to work with, but it also has more signal loss than other cables. We’re going to start with this one and see how it goes. So just connect one end of the cable to the bottom of the external antenna and run the other end into the building. Alright, we’re back inside. We ran the cable down the TV tower and then in through the foundation and up into the building. The next step is to determine the best place to mount the inside antenna. Ideally, you want this inr the middle of the area that needs to be covered, so for us, that’s right here in the middle of the house. You also want to keep it away from any other metal or cords that could interfere with the signal. We’ve already got the inside antenna attached to the amplifier, so next we’re just going to attach the outside antenna cable, and attach it to the outside antenna port. The next step is just to plug in the power, which we’ve got right here. And we give it a second to startup and if you look right here you may be able to see that there’s a green light and that means that it’s working correctly. If we had a red light, or if it was flashing red and green, we would know that there was a problem. Usually this is because the inside and outside antennas are too close together. If you see anything other than a green light, consult the setup guide for troubleshooting steps or give us a call. You can see that it’s now reporting that we get 5 bars of Verizon 3G. If we enable the field test mode, you can see that we’re at -70 decibels. That’s a 36 decibel improvement. Let’s try a phone call just to see if it works. We’ll try the main UberSignal number and see if we get a connection this time. You can see by the numbers here that the call connected immediately instead of waiting. And there’s the phone call, that works! Lastly, let’s do a speed test and see if we can actually get some data this time. You’ll remember that last time the test wouldn’t even run. For our ping test we have 120 ms of latency. When I tried it before the signal booster, it was over 1000 ms. The download test is reporting 0.69 mbps. The upload speed looks like it’s going to be a bit low at 0.15 mbps. It’s definitely a usable connection. After some more testing, it looks like we’re getting a better signal up to about 10 feet from the amplifier. Since the signal on the roof was only one bar, or about -104 decibels, according to the YX545 box, we should only expect one small room of coverage, and that’s about what we’re getting. While this is better than what we had, we may still be able to do a little better. If you remember, I mentioned that the included cable isn’t the best, so I’ve brought along a 50 ft RG-6 cable, which is the same kind of cable you use for cable TV or a satellite dish. This cable is from our website and is made by Wilson Electronics, another signal booster manufacturer, but you can try any RG-6 cable that’s available from an electronics or home improvement store. Note that this only works for amplifiers and antennas with an F style connector, which is the same connector that you see on the back of a TV. I’m going to replace the included cable with this new one and we’ll recheck the signal strength. But first, I’m going to unplug the signal booster, which you should always do before adjusting any of the connections. Alright, I’m back and we’ve got the new cable in place so let’s take a look at these two cables. The white one is the one that comes with the YX545 and the black one is standard RG-6 cable. You can see just by the thickness difference that the RG-6 is a much higher quality cable and that results in much less signal loss. So let’s take a look at the phone one more time. You can see that we still have 5 bars of Verizon Wireless 3G signal, but let’s enable the field test mode. This is now showing -62 dB. That’s a very strong signal. That’s another 8 dB gain over the original cable, so just by replacing the cable, we get another 8 dB improvement. We can try another phone call, and that should work out just fine. Again it connects right away. Let’s try another speed test one more time. We get a slightly faster ping. The download speeds, instead of being in the 0.5 mbps to 0.6 mbps range, we’re now seeing 1.36 mbps, so that’s almost twice as fast. For upload speeds, we’re now seeing 0.32 mbps, so that is also twice as fast. So just by switching the cable, we can dramatically improve the performance of this amplifier. After more testing off camera, we now get a signal throughout the entire house. That means no more dropped calls while inside and fast Internet speeds. The signal extends about 18 to 20 feet from the amplifier, which means that we’re getting just over 1000 square feet of coverage with the upgraded cable. With only 1 bar of signal at the outside antenna, that’s about what you should expect from the YX545. Overall, I think the zBoost YX545 is a great amplifier and as we’ve seen, it can improve your cell phone reception even with a very weak signal. If you have any questions, please give us a call and we’d be happy to help. I’m Dan with UberSignal.com and I hope you found this video useful. I just set up a zBoost YX545 for my shop, which is a 60' x 30' metal building that has always been a black hole of cell coverage. After finding the corner of the shop with strongest signal (3-4 bars of 3G signal) I mounted the outdoor antenna on a 3' length of PVC pipe that I attached to the peak of the roof and ran the cable down through the attic and into the interior (just one big room with a small office in the corner). Eagerly anticipating actual cell reception inside, I plugged in the base unit once the RG-6 coax that I purchased separately was attached only to get a quickly flashing red/green light. Now according to the manual this indicates that "the amplifier is disabled", and I should unplug and try again. Okay, not super informative. So I unplug and try again numerous times only to get the same result. Is something wrong with the amplifier? Do I need to do something to enable it? Or do I need to increase the distance between the amplifier and antenna? I feel like if the distance was the problem I would be getting the slowly alternating red/green light, which the manual explains indicates a "non-ideal setup" requiring increased distance between the two. The antenna is about 20' off the ground and the base amplifier is sitting about 4' off the floor in the shop. Horizontal distance between the two is about 20-30'. I am using 50' RG-6 cable rather than the included thin cable. I am pulling my hair out trying to figure this out and have had no luck with Wi-Ex support and thought I would ask you after finding this page. Thanks in advance! James, I apologize for not seeing your comment earlier. Generally, when you get the fast flashing lights, that indicates a problem with the amplifier itself and we've found it's often necessary to replace the unit. You can either continue to try to contact Wi-Ex support, or just return the unit to the place where you purchased it and tell them it is defective and that you would like a new one. You're correct in thinking that if it was a separation issue, the lights would be slowly flashing, not quickly. Let us know if you were able to resolve this and if a new unit works better!